The Bowls After Dark Evening Gala is our Signature Fundraising Event. The event includes delicious soups created by local chefs, live auction and paddle raise emceed by former Bronco Reggie Rivers, silent auction, full cash bar, live acoustic music, wine pull, hand painted souvenir bowls and much more! For more details click on the Buy Tickets link below. 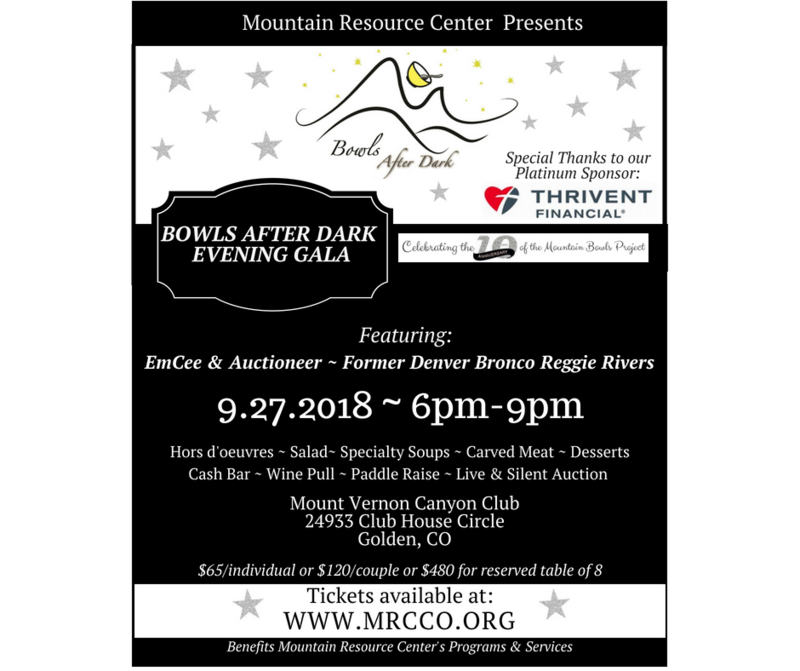 The Mountain Bows Project Fundraiser consists of our Bowls After Dark Evening Gala (September 27th) and Mountain Bowls Luncheon and Dinner (October 16th). The project encourages community to come together, hand paint bowls, enjoy amazing local soups, all while supporting a cause that truly impacts the lives of our neighbors. The bowls are then given out as souvenirs at all three Mountain Bowls Project events. The bowls serve as a reminder for the support needed in our community for services such as those provided by Mountain Resource Center.